What better way can there be to improve your finances then starting up a new business and making it flourish. Easier said than done obviously! But, simply the art of coming up with ideas to fill gaps in the market is fun. That’s why this new section for this website has been created. There is no plan to start these companies up. But it’s better to share these ideas with the world than simply put them in the digital recycle bin. Make no mistake, a lot of these thoughts and ideas will be damn bad ideas. I don’t care, the creativity and challenging the brain is a fun process. Who knows, maybe one day it will trigger something in someone’s head and they start-up something and become a millionaire from it, I would love to say I planted that seed! With that being said, let’s get on with the first business idea. 4 Is this already done? The basic thought process here: Car tax can be paid monthly, car insurance can be paid monthly, why not annual mot+fixes? In a nutshell, the business idea is: Startup a finance company. Not with huge rates like Wonga type firms. With fair low-interest rates. For people who need to pay for their cars MOT and subsequent fixes (when it fails MOT) but they don’t want to splash out the lump sum. Instead they can spread the cost over the next 12 months. You’re probably thinking this is just a normal loan company, except all the loans have to be 12 months long. Wrong. My thinking is that customers apply before they have their MOT to check their credit history. Then they can be pre-approved ahead of time for fixes up to a maximum amount and they’re told what the interest rate will be. The person then takes their car for the MOT as normal. On occasions it fails they get it fixed where they choose. Once the new MOT has been issued they upload invoice screenshots from the mechanic. 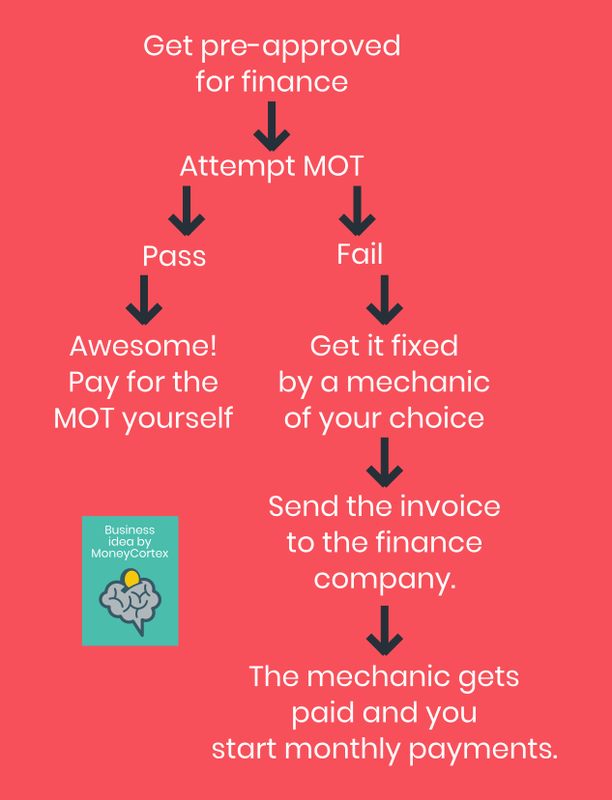 The finance company pays the mechanic directly and the customer pays back the finance company an agreed monthly amount over the next year until their next MOT. Imagine your MOT and repairs cost £400, you agree to a 12% interest rate. The total to pay would be £448. Spread over 12 months that’s only £36 per month. If you’re having cashflow issues then the idea of £37.30 per month for 12 months may seem very appealing compared to forking out £400 upfront. I’ve had a quick look at British companies like Halfords and KwikFit. They don’t offer this exact type of service. At Halfords if your car repairs are over £200 you can get free credit but you have to put down a 25% deposit and pay off the balance over the following 3 months. That doesn’t give you much time. At Kwikfit they don’t seem to have anything like it for MOT and repairs. For services they have ServiceCare. Your car has a full service and you spread the cost over 10 months. But that’s a service. Nothing to do with the MOT or repairs. It’s also limited, your car must be under 10 years old and done under 100,000 miles. Both of the above things are correct at time of writing this blog post. In the format I’ve described the business idea, it doesn’t appear anyone does it. Of course as an alternative you could just go and get a traditional bank loan. But that would require the time to apply for it and get it approved. Then you have to pay the mechanic yourself. Using a bank loan would be a long-winded way to go about it. Credit card is always an option. But most credit cards would have a higher interest rate meaning it would cost more. Plus with a credit card you’d run the risk of not paying it back and only paying off the minimum balance if you’re not disciplined. Is there a market for this? I would’ve thought so. As somebody who drives a 15 year old car myself I’d certainly be interested in this type of thing as long as the interest rate was fair. You can easily spread out your car insurance and car tax costs, why not the MOT+repairs too! Fair interest rates, slightly lower than credit cards. Low minimum bill value, perhaps £200. Customers must be able to pick themselves which mechanic they use. Quick uploads of invoices, preferably via app or PC would be critical to user experience. Fast payments to mechanics would be critical for their trust. That’s it! For the first business idea in this new section of the website I hope you enjoyed it. If you’re reading this then at least you read all the way down. Do you think this has any legs? Or would customers not be interested.